Burundi is one of the three poorest nations in the world according to the World Bank. The United Nations state that over 400,000 people have fled the country in fear of political violence and a return to civil war. Against this backdrop of fear, abject poverty and uncertainty, there remains a lot of enthusiasm amongst High School students to attend Bible clubs. The pupils really enjoy the Bible study but they cannot afford to buy their own Bible, so they can’t continue their study at home. This project addresses this problem by helping pupils buy their own Bible. 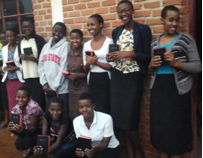 We work with Scripture Union Burundi to run Bible clubs in High Schools all over Burundi. Thousands of children attend but they need their own Bible. That’s where we come in. With the help of Westhill Endowment we are able to provide Bibles to the children on a loan basis which they can pay back over the course of a year. We also need to train more volunteers to support the High School Bible Clubs.